When you play this card, put the top 3 cards of your deck into your discard pile. Then, you may put a Friend from your discard pile into play. 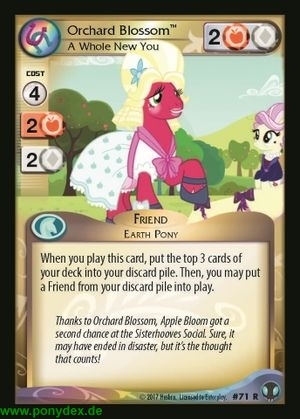 Thanks to Orchard Blossom, Apple Bloom got a second chance at the Sisterhooves Social. Sure, it may have ended in disaster, but it's the thought that counts!